"This was a major turning point for Ada. She was excited to realize that math and imagination did not have to be opposites - as her mother had wanted so desperately to impress on her - they actually went together! Ada saw in Charles a person with whom she could discuss ideas. A great friendship started to grow. Dozens of letters began ... "
In her first book in this series, Tanya Lee Stone asked Who Says Women Can’t Be Doctors? (about Elizabeth Blackwell). 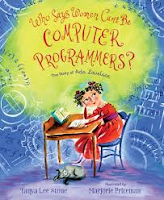 In this brand new book, she introduces readers to Ada Lovelace, daughter of Lord and Lady Byron. Lady Byron was concerned about her daughter's imagination, thinking it a detriment. It connected her to a father who left early in Ada's life and was not seen again. "Lady Byron decided the best way to make sure Ada didn't grow up to have a wild imagination like her father was to train her to think like a mathematician, so she hired tutors for Ada from the time she was four." Ada's other interests included "drawing, writing, singing and playing the piano and violin." Her imagination led her on many flights of fancy, all disapproved of by her mother who only wanted her to marry well. At one such gathering meant to introduce Ada to proper society, she met Charles Babbage, an inventor with a fine mind. The two of them talked endlessly, sharing ideas and empowering Ada to find her own voice concerning mathematical discoveries. Writing about Babbage's Analytical Machine, and imagining how it could really work, brought recognition today as the first computer programmer. "Charles never raised the money he needed for his invention, but if the Analytical Machine had been built at the time, it is quite possible that the entire age of computers would have begun more than one hundred years earlier than it did. And in large part we would have Ada, with her brain of a mathematician and her imagination of a poet, to thank." Marjorie Priceman's soaring gouache illustrations fill the pages with details concerning the setting, the historical period, the joy Ada found in learning, and the imaginative wonder that was part of her being. Should you want to learn more about this deserving woman, here are a few books to check out.